With the weather on our side (for once!) and a picnic basket full of vegan goodies, Kieran and I set off for The Blue Pool in Wareham after I spotted this amazing looking lake online a few weeks before. I expected this stunning looking crystal clear lake to belong in the heart of an American woodland, but was surprised - and excited - to find out that it was right on my own doorstep… give or take a 40 minute drive. After paying the £6 admission fee, which contributes towards the upkeep of the lake, we made our way around the ‘red’ route. This route seemed ideal for us, as it had no steps or slopes, and meant that we could find a less intrusive spot for our picnic. We eventually reached our first high spot in the hills, which overlooked the entire expanse of the glittering lake, and it’s safe to say I made up for the lack of photographing I’ve done of late! To me, it looked so tranquil and welcoming, with the only disruption coming in the form dragonflies and magpies skimming the waters… and the occasional dog coming to say hello! Around half way, Kieran and I decided to set up our picnic on a white sanded area close to the shore. We opted for easy to make, simple vegan lunches, including a mixed salad and avocado sandwich for me, with Kieran going for a peanut butter alternative. We then made our way through a bag of veggie crisps with caramelised onion hummus… so good. After a somewhat hectic week, finding solace in The Blue Pool made my anxieties disappear for a moment as I soaked up the sunshine and middle-of-nowhere atmosphere. It doesn’t take much other than the company of my favourite handsome human, good food and a forest to cheer me up! After a while, we packed up and continued on our mini venture around the lake. Kieran of course couldn't resist climbing these tree stumps, which he did with ease. I, however, didn’t fare so elegantly when walking down this slanted hill towards the waterfront. Lets just say my jeans fared better than my dignity! After completing the loop, and paying a visit to the mini pool with its beautiful water lilies, we decided to make the most of our relaxing Sunday by heading towards The Pig on the Beach in Studland. It was packed (unsurprisingly) so we opted for a tea and Kieran’s double espresso. We then made our way around the kitchen garden and green house, which smelt incredible, before paying a visit to some cute (and amusingly noisy!) sheep on the grounds. So, my visit to The Blue Pool and Studland has only reminded me of how lucky I am to live where I do. I get told frequently by those living elsewhere that the South Coast of Dorset must be a beautiful place to be… and I can only agree. 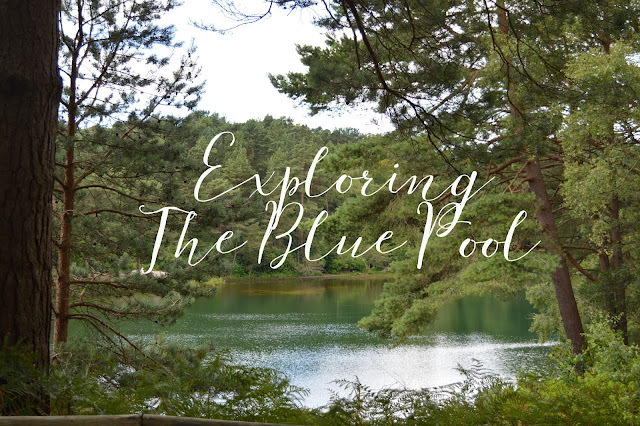 After discovering The Blue Pool today, I love knowing that there’s still so much left to find!